The Complex of 96 bungalows of 66m² each, with two bedrooms, lounge-dining room with integrated kitchen, bathroom and ample terrace and private garden. 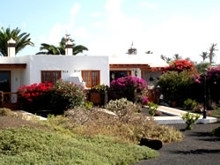 Some of the homes have excellent sea views and views over the neighbouring island of Fuerteventura. The prices vary depending on the size of the plot and the views of the Bungalow. 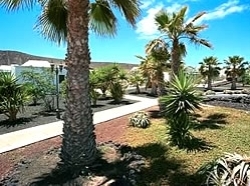 All of the Bungalows have been completely reformed during the Summer of 2005. All have Television connection with Satellite channel reception, Telephone and Internet connection. There is a marvellous community swimming pool and also a tennis court and squash court. There are also Parking spaces in the community Parking area. The Complex has no architectural barriers and conforms to the European Ruling on Accessability for the elderly and discapacitated.